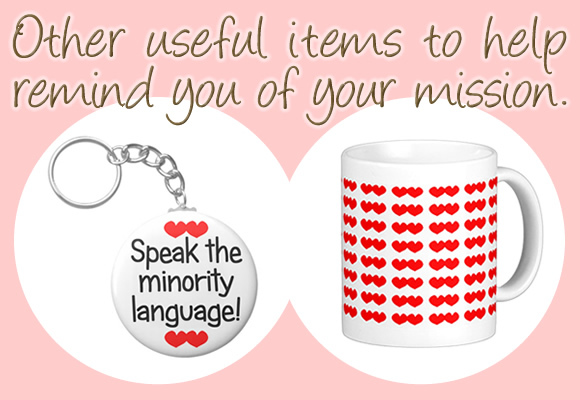 Products from Bilingual Style are not only unique and appealing, they are designed to celebrate your family’s bilingual identity and support your long-term success by serving as daily reminders of your mission. Who is behind Bilingual Style? Bilingual Monkeys has partnered with Zazzle, an online retailer, to open the Bilingual Style store. Adam Beck, the founder of Bilingual Monkeys, creates the designs and Zazzle manufactures the products in the United States. You’ll find a variety of cute clothing for babies and children, clothing for adults, and useful items for the home, including coffee mugs, bags, and keychains—all featuring a bilingual or trilingual theme. And new products will continue to be added! 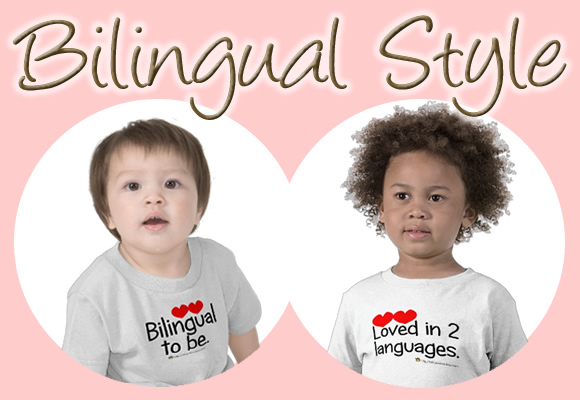 A child’s T-shirt from Bilingual Style is much more than a cool shirt: it’s a symbol of your identity and your dream. When worn by the child, the shirt serves a powerful purpose by deepening that important identity and reminding you to keep up your efforts to realize that heartfelt dream. In this way, products from Bilingual Style become special “charms” that will help fuel your success—and add to your fun—on the bilingual journey. The main language used in the products is English, with clothing for babies and children also available in Spanish. However, many other languages are mentioned, too, and these languages may be used on more products in the future, as with Spanish. At the same time, some products use only images in their designs, which make them “universal” for all. In addition to “bilingual” and “trilingual” products, “multilingual” products (for families with four or more languages) are being considered, too. Zazzle makes it easy! At the Bilingual Style store, just choose the product you like, as well as the size and color (for clothing), then check out. It’s very simple and very secure. Remember, too, that products from Bilingual Style make great gifts. You can have something sent to a family member or friend anywhere in the world! Can I make a request for a product idea or design? Sure! Requests are gladly considered, though actually meeting the request may not always be possible. Just contact Adam with your suggestions. Sounds good! Where’s the store? 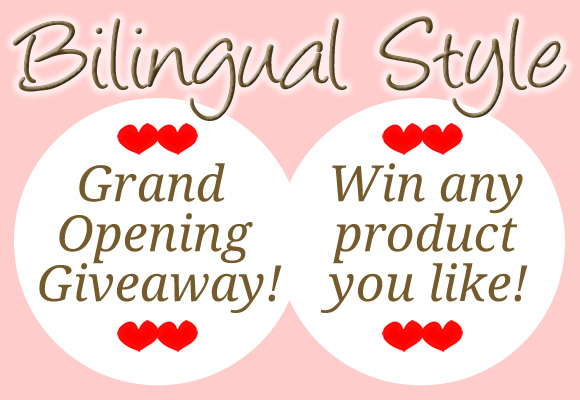 To celebrate the opening of Bilingual Style, I’m holding a giveaway! If you’re one of the 2 lucky winners, you can choose any product you like from the Bilingual Style store and I’ll have it shipped right to you! The winners are in! As promised, my kids randomly picked the winning entries from an empty tub of Lego. Lulu went first and drew out…Margarita in Greece! Then Roy’s little paw picked…Elke in the United States! Congratulations to you both! You’ve won anything you like from the Bilingual Style store! Thanks again to all those who entered the giveaway and shared the opening of Bilingual Style with others. I’m also grateful for your good suggestions for new product ideas. Note: I’m using the “honor system” for this first step, but I’d be really grateful for your support in sharing these links with others who may be interested in Bilingual Style. Note: Visit the Bilingual Style store to choose a product. If you’re a winner and you change your mind later, that’s fine. 3. All entries must be submitted by the morning of Saturday, May 17 (Japan time). On that day, the comments will be printed out and cut apart to serve as entry slips for the drawing. The slips will be placed in my son’s big, empty tub of Lego (because his millions of Lego pieces are always littering the floor instead), and I’ll ask Roy and Lulu to reach inside, each pulling out one lucky winner. I’ll then contact the two winners and update this post with the results. I won’t respond to your comments here, but I do look forward to reading them. Thank you for entering the giveaway, and for sharing the opening of Bilingual Style! I’d like to see more languages in the store, and would be happy to lend a hand for German/French. Would like to see cute baby socks and pants! Idea for the poster is great! Would love to see it !!!! So many beautiful things in the store. Thank you for the opportunity to win some of the great stuff ! Magnets for fridge and classroom – would love to display for my students and kids. Love the items in the store already. Good luck, I’m so excited for you Adam. -newborn, 1 week old boy! 4. So hard to choose! 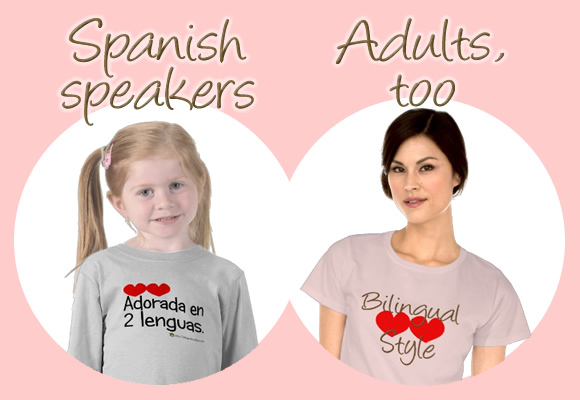 As a bilingual teacher I love the travel mugs & “I heart code-switching” shirt, but ultimately, I’m a sucker for advertising via my son and would probably choose the “loved in two languages” toddler shirt. Or maybe “Adorado en dos lenguas.” Nice job on the product line! 5. I LOVE the magnet suggestion. I can’t connect to facebook here at school, but promise to re-post once I get home! Would love items that have both/all three languages on them, esp. those shirts that list the second language, e.g., I <3 <3 English and ?????. 5. More clothes for mums which are NOT classic T-shirt cut, but rather something trendy Maybe a long tight top for women with loose neckline. Beach bag. Loved in 3 languages t-shirt or onesie! A trilingual bookbag, mais oui! Genius idea by the way! Love it! Thanks for all your nice posts Adam! 5. I like these ideas mentioned above: diaper bags (though I don’t need one anymore, it would make a great gift), magnets, note pads, pencils and pens, car stickers, and family member t-shirts. I also agree with Margarita that it would be nice to have some more style-conscious t-shirt or tops. And I second the point made by Reina about the hearts being on the girly side (at least for some young boys, including mine), and that having other symbols or images would be a nice option. Maybe a tee with a word or phrase like “Proud to be bilingual” in several languages at once, or a multilingual background and superimposed on it “Proud to be bilingual” (or multilingual) or “Thankful to speak two languages” or some such phrase. 5. I would love to see some gear in German…love the Spanish stuff! Really great stuff you got going there – keep up the good inspiration! Ok, now the 14 yr old is involved: “Bilingual: Double the languages, double the COOL!” (remaining T-shirt suggestions are not suitable for a PG audience). OK, that’s it for now, signing out from Milan, and wishing you all the best of luck with this great new project! We plan to place an order soon! 5. Polish language mixed with English. I made myself a t-shirt that says: I’m bilingual. A ty? — that translates to: I’m bilingual. And you?